Stardust and glitter and rainbows, oh my! Did you know that unicorns polish their horns with fairy dust and moonbeams, and that they love looking at their reflections? 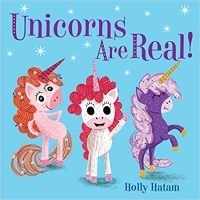 Unicorn lovers will be tickled to learn all sorts of "facts" about these beloved mythical creatures in Holly Hatam's (#1 New York Times bestselling illustrator) unique Mythical Creatures Are Real board book. UNICORNS ARE REAL! is a bright, colorful, and cute book about unicorns. The images really leap off the page with vivid colors and cute unicorns acting out the phrases on each page. Unicorns are very vain and consumed with their appearance, although they also like fairytales, identifying young children who they are thrilled to learn are real. What I loved: The illustrations are top-notch with lots of bright colors and cute unicorns. The full page designs are fun to look at and search through to examine the many unicorns pictured. Some of the phrases are really funny and clever (such as that about unicorns believing in fairytales with the unicorns peeking out at the human girls through the forest and remarking about them being real). The vivid images will really appeal to the youngest readers. The word-to-image ratio is also great, and the pages can turn quickly. What left me wanting more: Many phrases are about unicorns’ appearances, such as what they wear to how they polish their horns. I would have liked more substance, such as what more intellectual pursuits they enjoy (e.g. do they like to read fairytales? Or do they like to learn about something?). Additionally, they like to eat sugary foods, and it would have been nice to have some sweet fruits as a good example for toddlers/young children versus the demonstrated cakes and cookies. There are also two pages about their bodily excretions (they poop cotton candy and their tears are delicious), which suggest such excretions are or should be edible, and I personally would rather that these were left out so that a toddler may not get ideas about this. These are relatively minor concerns, overall, however. Final thoughts: This board book features vivid and bright illustrations of adorable unicorns along with “facts” about how they live. The images were great and most of the facts were really cute and fun. Toddlers will enjoy learning about these amusing animals and flipping through the entertaining illustrations.